Peugeot 206 engine cooling fan wiring and relays. Cooling fan not working and car boiling over due to very badly corroded wires at relays and wires broken off. Low speed cooling fan not working and water temp getting too hot and temp gauge reading about 90 degrees and then going rapidly in red / hot area and dash flashing “STOP”. Cooling fan then cuts in at fast speed. Fault was corroded connector at low speed fan resistor. The cooling fan can be operated using the Bosch KTS or other diagnostic/ scan tools machines in the functions testing area. The operation of the coolant temp sensors and the fan relays can be checked using the Bosch KTS in the live data area. 3 areas too look at. Fan relay operation on or off. I believe the system works something like this. With the engine cold the cooling fan is off. When the engine is running the water temperature slowly increases and the green temperature transmitter varies its resistance and at about 96 97 98 degrees C the low speed fan should come on cool the engine and then switch off again and continue cycling like this. If it’s a very hot day and the water temp gets a little hotter the relays then bypass the resistor and the fan then works at full speed. This also happens if the car has got air con and is turned on. If the coolant temp sensor should be faulty and go open circuit or if you unplug it a fault code will be logged and then operate the cooling fan very briefly ½ a second or so at low speed and then go to full speed. ONLY WTH THE ENGINE RUNNING. If the slow speed fan should not work for any reason the water temp will increase slowly to about 96 97 98 98 degrees and then the temp gauge will move very rapidly from the normal area to the red/high temp area. The dash display will then flash stop. Cooling fan then cuts in at fast speed. This Peugeot 206 ECU has a maximum of 50 fault code clear downs and then a new ECU is required. So don’t disconnect coolant temp sensors with the ignition on. The 2 radiator fan relays are situated behind the front grille. When standing in front of the car they are to the left of the radiator behind a plastic cover held on by three plastic scrivets/poppers. To remove them remove the screws securing the black plastic trim around the bonnet catch. Then remove the painted trim that goes across the car and under both headlamps 3or 4 screws and then two trim clips at the very end on either end. The clips on the end can be removed by putting a trim removing tool behind the trim on the very end and levering the trim forwards away from the car. They are quite tight don’t scratch the paint. You can then reach in and using a trim tool pull the heads out of the 3 scrivets / poppers. Remove the plastic cover and you will see the 2 fan relays. The original Peugeot ones are green colour. The low speed fan resistor is fitted near the fan relays but lower down and inside the cowling of the radiator fan. It is held on by one 10mm headed bolt. Access to this is a bit tight and can be accessed from under the car by undoing the two 10mm bolts holding the lower side of the bumper. The Bosch type electrical plug is tricky to get off due to lack of space to press in the metal locking clip. I did this using an old screwdriver with the blade sawn off and a V shaped groove cut in. 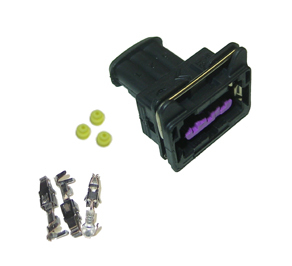 The clip holding the wiring loom to the radiator cowling can be eased out by using a long screw driver and the wiring can be pulled out below the car just enough to clean the plug connections of the resistor plug. For major wiring repairs it may be necessary to remove the front bumper. Remove front black trim around bonnet catch. Remove under headlamp painted trim. I need the temperature and resistance values for coolant temp sensor. Temperature at which the cooling fans should come on low speed and fast. Supplier of the Bosch style 3 pin plug. What is the blue sensor for?